The Groton Private tow is located just east of Groton on Rte 119, just past the Johnson's Dairy Bar. This is NOT Skyfields like many people (especially myself!) always thought. I always assumed it was a section of Skyfields on the back side, but a Terraserver image and other people's info on this area suggest otherwise. 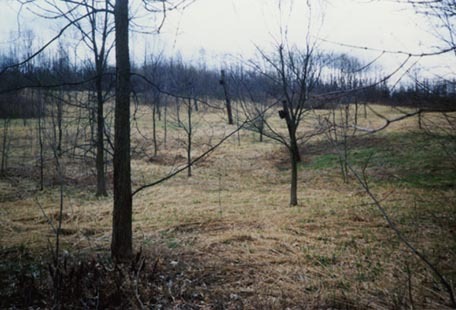 According to David Rodenhizer, the rope tow line "appeared" one day, was never opened to the public, and was on private property. Here's the Terraserver map of the area. Since the tow was on a field, it certainly doesn't look like a traditional ski area from above! Skyfields is to the upper right of this area, and as you can see, was clearly not a part of it. Bruce White has some more info: This area was there before Dave, he just didn't notice it. It was part of a farm. 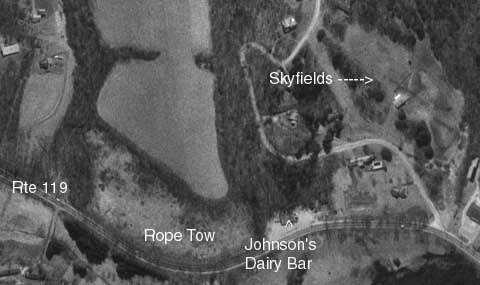 The whole area (Including Skyfield's) was owned by Walt and Mary Lou Weiwal. (Think that is spelling - may have been Wiewal) Walt died a few years back, and was a pilot who flew small planes. If you look at the terraserver photo, the field at the top of the hill where the tow was - Walt used to occasionally land his plane there. Don't remember tow actually ever running. It was one of his ideas that didn't quite make it. I know he did fire it up a few times for parties when I was very young (Age < 6) but by the time I was friends with his youngest (Michael - my age) it was a dead idea. Walt and Mary Lou divorced about 1970 and the kids (along with any reason to do anything with it) went away. Last I knew they were in Maine. Do you remember this ski area? Perhaps saw it in operation?